The Smoker Grill has vents in the sides of the lid to allow smoking as WELL as charcoal cooking! This grill offers a true 24" across the cooking surface, not the FRAME of the grill like others measure. The total cooking area is approximately 432 sq. inches. The grill also has a high dome lid to accomodate larger pieces of meat. 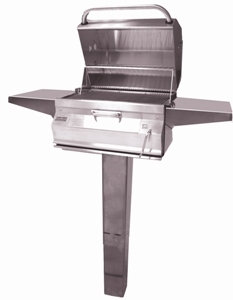 The grill is mounted to a stainless steel post which will extend approximately 18" in to the ground to provide stability. Your natural gas line is routed inside the post and is attached to the control panel.